Model A Ford 24hp Engine Gasket set without the Head Gasket. Fits 1928-31 motors. Ideal if you want to add the new premium head gasket. 1932-34 Gasket set. Complete engine gasket set for the 1932-34 4-cylinder model B engines. Comes with an asbestos style head gasket. No more leaks. A New Style Head Gasket incorporating silicone sealant. Premium head gasket for Stock 24hp Model A Head 1928-31. This unique gasket has a solid steel core sandwiched by heavy-duty high density gasket material coated with silicone. Additional high temperature silicone bands surround all water passages. Install with no additional sealants! (Use B-6051-M when running a 'B' head or a High compression head). Premium head gasket for the 24hp model B engine or a model A when fitted with a high compression Head. This unique gasket has a solid steel core sandwiched by heavy-duty high density gasket material coated with silicone. Additional high temperature silicone bands surround all water passages. Install with no additional sealants! 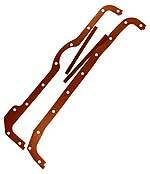 If you have a stock Model A engine, order the A-6051-M.
1928-31 Model A Copper Head Gasket for the 24hp engine. Graphite type head gasket for the 1928-31 Model A Ford engine. Use this one with a standard Model A cylinder Head. Made in USA. Graphite type head gasket for the Model B 4-cylinder 24hp engine, or a Ford model A when fitted with a high compression Head. Made in USA. Copper head gasket for the 1932-34 4-cylinder 24hp engine, or model A when fitted with a high compression Head. Made in USA. Head gasket for the smaller English 1932-34 4-cylinder 14.9hp engine. These are new old stock, very limited supply. 1928-31 Model A Head Gasket for the smaller English 14.9hp engine. Gasket set Complete Set 1928-31. The complete engine gasket set for the 24hp model A Ford with a copper head gasket. Fits 1928-31 motors. Made in USA. Rear main oil seal for the 1928-31 Model A Ford engine. This is the original type cast aluminum insert that goes up into the block. It is best to replace this when overhauling an engine. Modern rear main seal 1928-31. A specially designed seal to get rid of that nasty rear main oil leak. The crankshaft must be machined in order to use this seal. Made in USA. Rear main oil seal for the 1932-34 4 cylinder engine. This is the original type cast aluminum insert that goes up into the block. It is best to replace this when overhauling an engine. This is a modified Model B Rear Main Seal, for use in the 1932-34 four cylinder engine. This will allow you to use the B-6335-M as a 1 piece seal without having to slit the neoprene seal in half. Note: Not for use with original style cranks that have not had the slinger machined. This radial lip seal made of nitrile, is made for the Model B 1932-1934 4-cylinder engine, to get rid of those nasty rear main oil leaks and can be used 2 different ways. The kit contains two nitrile rings. When using this seal with the original B-6335 seal, you will use half of one ring and half of the other ring. If you use the B-6335-X rear main seal, you will be able to use one of the nitrile rings in one piece without having to cut them. Rear main thrust 1928-31. This bronze thrust washer replaces the original A-6335 rear main seal that went up in the block. If the babbit on your old rear main bearing has cracked, this will now act as your thrust. Also used for inserted engines! Made in USA. This packing is used in the timing cover, and in the front of the oil pan to seal around the crankshaft. Two are required. Also fits V8 (except 60hp engine) Made in USA. Rear Sump Cork Packing for the 1928-29 Model A. 6 7/8" long, 13/32" wide. May need to be trimmed slightly shorter. Rear Sump Cork Packing for the 1930-31 Model A. 8 1/4" long, 3/8" wide. May need to be trimmed slightly shorter. A modern neoprene seal that replaces the old 2 piece style rope seal in the front of the motor. The bottom rests in the oil pan, and the top in the timing gear cover. No matching required. Made in USA. If you are fitting your sump with the engine still in the car, these plastic guides save a lot of headaches. They thread into the 4 corners of the block to make installing the oil pan and gaskets easier. Slide the gasket up over the guide and then the oil pan. Guides will hold the pan/gaskets in place while you thread the mounting bolts into the block. Note: Use two sets to make the job even easier. 1928-31 Standard cork type Sump Gasket Set . A complete set of all the gaskets needed when removing the oil pan. 1928-31 Modern style cork sump gasket set for the Model A Ford engine. A complete set of all the modern style ruberised cork gaskets needed when removing the oil sump. Model 'B' Sump gasket 1932-34. These are the Sump gaskets for the 1932-34 4 cylinder engine. The 1928 oil sump had a clean out cover on the oil pan directly under where the oil pump is. Made in USA.